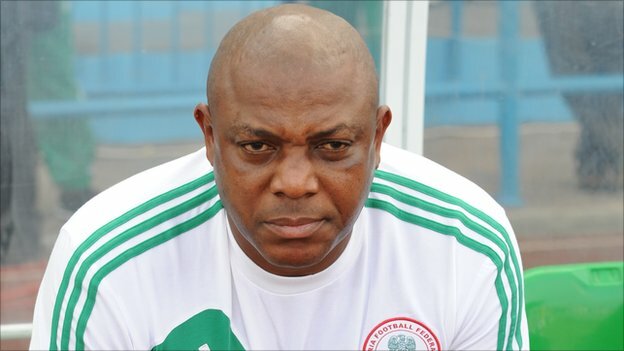 Stephen Okechukwu Keshi (born 23 January 1962) is a Nigerian football manager and former football defender who has managed the Nigeria national team since 2011. He is one of only two people, along with Egypt’s Mahmoud El-Gohary, to have won the Africa Cup of Nations as both a player and a coach. After a playing career mostly with Belgian clubs, Keshi went to the United States to be educated in coaching. In 1996 he was joined by Augustine Eguavoen, who once coached the Nigerian national team. They played together in California as the backbone of the defence for the short-lived Sacramento Scorpions. Keshi has been a part of the coaching staff for the Nigerian national team, most notably as head coach for the Junior Eagles at the 2001 African Youth Championship which also served as qualification for the 2001 FIFA World Youth Championship, without success. Between 2004 and 2006 Keshi coached the Togo national football team, unexpectedly bringing them to their first World Cup tournament,Germany 2006. Having secured Togo’s unlikely qualification, he was promptly replaced by German coach Otto Pfister prior to the World Cup finals, after Togo showed a dismal performance and failed to advance to the knock-out stage in 2006 African Cup of Nations in Egypt. However, Pfister did not last beyond a controversial World Cup campaign that nearly resulted in a player’s strike over pay and Togo remained without a manager until February 2007 when they re-engaged Keshi in time for a friendly against Cameroon. He worked as manager of the Mali national football team, after being appointed in April 2008 on a two-year deal. Keshi was sacked in January 2010, after Mali’s early exit in the group stages of the Africa Cup of Nations. Keshi became coach of the Nigerian National Team in 2011. He led Nigeria to qualification for the 2013 Africa Cup of Nations, which they went on to win, defeating Burkina Faso 1–0 in the final. The following day Keshi handed in his resignation, only to reverse his decision the day after. Keshi led Nigeria to the 2013 Confederations Cup. On 17 June 2013, in Nigeria’s first game of the tournament, they beatTahiti 6-1. In their next game, on 20 June 2013, they faced off against Uruguay in a 1-2 defeat. With 3 points from their first two games, they knew they needed to win their next game in order to have any chance of qualifying. This was because Uruguay were expected to beat Tahiti, which they did 8-0. So the Nigerian team knew they had to beat Spain in their final group game. They lost 0-3 to the Spanish side on 23 June 2013. As a result, they finished third in the group with 3 points and were thus eliminated.